Cybathlon 2016 (www.cybathlon.ethz.ch), which will be held in Zurich (Switzerland) on October 8, 2016, is a championship dedicated to pilots with disabilities using advanced assistive devices in various competitions. The vision of Cybathlon is to provide a platform for the development of novel assistive technologies that are useful for daily life and are able to contribute towards breaking down barriers between the public, people with disabilities, and science. Brain Products will support the “BCI Race” as part of the Cybathlon and supply hard- and/or application software along with comprehensive support for a total of 5 teams entering the game. BCI Race? 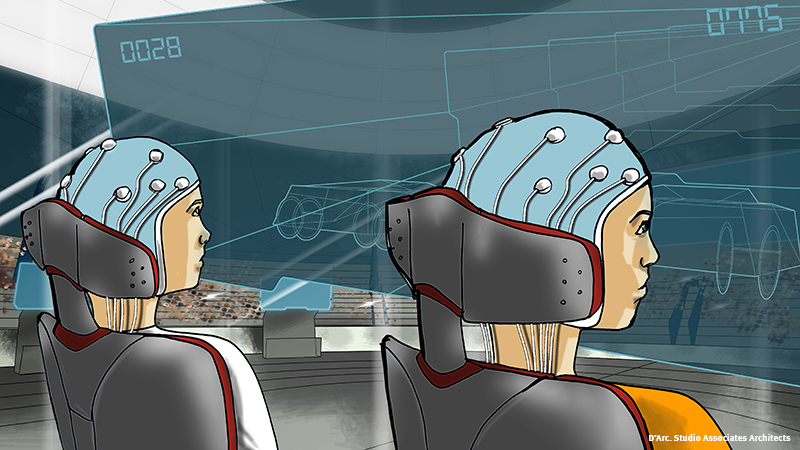 Pilots will be equipped with brain-computer interfaces (BCIs) enabling them to control an avatar in a racing game played on computers. To make sure the audience won´t go short, special visual and auditory effects will be featured throughout the racing game. Click here for detailed information on game characteristics and rules as well as for inclusion criteria for pilots and technology. What does Brain Products offer? Starting beginning of 2015 until the day of event in October 2016, we will supply full system configurations according to your individual project requirements including hardware solutions, which can be selected from either the actiCHamp (available with up to 160 channels) or the V-Amp amplifiers (up to 16 channels), as well as related software selected from the Brain Products Application Suite. On top of the hard- and software equipment we provide, our renowned company´s technical expertise will help your team along the way to optimally prepare and successfully participate in the “BCI Race”. Our contribution will be entirely free of charge for the teams that have qualified: Brain Products will supply the desired hard- and software on a free-of-charge loan basis for the full preparation period starting beginning of 2015 until the day of event in October 2016. The loaned equipment will need to be returned to us after the event. However, to make the competition even more enticing, we will award the highest ranked team sponsored by Brain Products with the full set of equipment that has been used in the game. Who is sponsored? We will support the 5 most expressively stated, cogent applications sent to us until December 31, 2014.